Looking at my skyscraper-like book piles at home, I realize that doing ‘monthly tally’ posts is not actually feasible. I already don’t remember what books I brought home in the past week, much less a month. My rate of acquisition is quite high (no, I don’t have piles of money, I have fellow booksellers and friends and my workplace). I might therefore attempt to do more frequent adoption/release updates in between actual reviews. Speaking of release/output/reading updates. Since I dearly love Saga by Brian K. Vaughan, I had to go and find his other stuff. In the past two weeks I made my way through the entire Ex Machina series he did with Tony Harris and a few other people. It is, unsurprisingly, well-done and intelligent and very, very different from Saga. 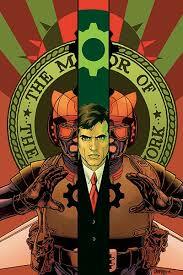 I think your enjoyment of Ex Machina will depend on whether you like politics in your graphic novels, since the main character is the Mayor of New York City. I can’t say I am normally a big fan of such things, but I also lived in NYC and had worked in a city archives before that, and I happen to find local politics quite interesting. I therefore enjoyed Ex Machina quite a bit, but on a cerebral, rather than emotional, level. Finally, If you are the sort of geek who enjoys not only reading genre, but reading and talking and listening about genre, you should go listen to episode #180 of The Coode Street Podcast. Not only it has Kelley Eskridge and Nicola Griffith on it, but the entire hour is a geek-fest of intelligent discussions about what might or might not be fantastic fiction, awards, publishing, and reading speculative fiction.